PFC Johnny K. Parker died of a gun shot wound to the chest. I think I remember the incident when Parker was killed. I think he was hit by a sniper who we in turn killed later in the day. I remember seeing Parker, lying in a bomb crater, when the medic was treating him. He was shot in the stomach, later medivaced, but were told that he died. I seem to recall that we decoyed the sniper during the medivac for Parker and got him as he was returning for another shot. Comanche was out in the weeds when this happened - we didn't even know about it until we were back on LZ Ike where we could hear Armed Forces Vietnam Network (AFVN) radio. Charlie Dickey was the new Recon Sergeant with Battery A, 1/77th Artillery. The Forward Observer party traveled with C 2/5 Cav, and provided that arc of steel and rockets around us during combat. This was was Charlie's first fire fight. From an email: " I also remember that some guys got hurt in the initial exchange of fire. One I think was first day in the field. He took fragments from a ChiCom grenade in the neck. (Webmaster Note: ChiCom meant Chinese Communist.) 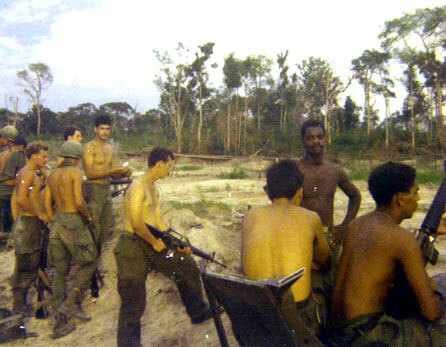 This is when Top Allen went forward to bring him back and that is when he traded grenades with the NVA. I swear I can still hear him laughing at the enemy. The FNG (Webmaster Note: F^*#%&! New Guy) was brought back to the command post, and it was dark. A call was made for Medevac and a Bird came in and hovered over a bomb crater that we illuminated with trip flares. We loaded the wounded, and off they went. The next day a resupply bird refused to land in daylight where a Medevac had landed at night while taking fire. After a long night we had a Mad Minute just before daybreak. It seems to me that I was sitting on the berm of a foxhole looking in and 2LT Hendrixson was facing out. It was then he said that he thought he saw a gook climbing down a tree. Sure enough, mortars came soon after. A Tracker Team was called in. I remember working forward with the tracker (he did not have a dog with him.) A break was called, and just as I sat down when the tracker about was it by AK fire. He was only 10 feet in front of me. I believe I was with 3rd Platoon when this went down. I remember helping to give first aid. The tracker had 17 days left in country. However, he was Line One upon arrival to Tay Ninh. (Webmaster Note: Line One meant killed in action.) (Source: Charlie Dickey) PFC Joseph A. Marasco died while attached to C 2/5 Cav, and we consider him one of our own. Nguyen Charlie was a regular feature cartoon in the Stars & Stripes newspaper. "As everyone prepared their positions, you could hear a "whoosh" sound pierce the air. It was immediately followed by an explosion. A couple troopers in the Squad close to Mike Ruther's position returned fire in the direction of the incoming round, but there was a quick cease fire. The NVA had disengaged and withdrawn. There was no enemy return fire after the initial engagement. SP4 Michael Ruhter had been standing during the initial attack, and an RPG round struck him in the upper leg. The runner from 1st Squad reported him as the only casualty, and that he died instantly because of the severity of the wound." However, the RPG round had burst above the ground, and it's shrapnel caused more casualties then would be normal for this weapon. Although Mike was the only fatality, the medics found about a dozen others in the 1st and 2nd Platoons who had been struck by the shrapnel, and they needed medical attention." Mike was blonde, well-mannered, somewhat reserved, team player, and fearless. In a letter I wrote my wife, dated 5 Dec. '68, Mike Ruhter is noted as the new kid from Minden, Nebraska. 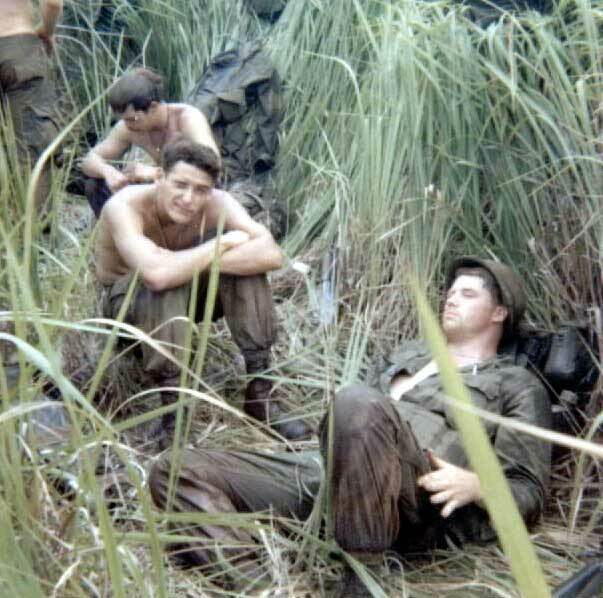 As far as I know, Mike Ruhter was only the second KIA from March 20, 1968 until July 23, 1969 of the 1st squad of the 1st Platoon. They were a tight bunch. Michael had been with the 1st Platoon for most of his tour. He was very tan and blonde haired. He looked more like a California surfer than a Nebraskan because he always had his shirt off. I also remember him carrying an M79 grenade launcher. He was quiet most of the time, but he was a really brave kid. There was no hesitancy on his part in a fire fight, and he would move forward with a total lack of fear. I can remember him on April 6 on the far right of the line, firing away when we assaulted the entrenched enemy that day. Michael Allen Ruhter was 18 at the time of his death. 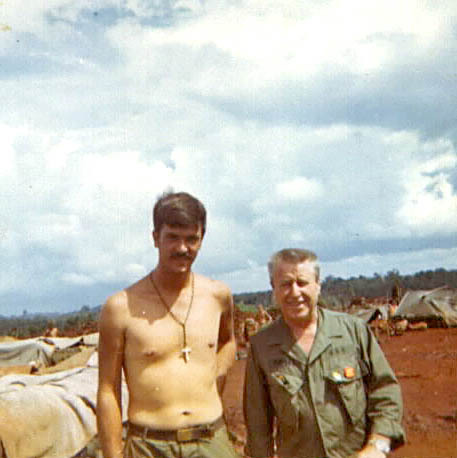 A draftee, he arrived in Vietnam in December, 1968. John "Greek" Kartinos, Squad Leader of 2nd Squad, 2nd Platoon, and the man who literally saved Joe Roudebush's life on July 22. 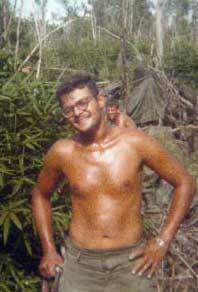 Mike Hayes, taken in the field while Charlie Company was working out of LZ Mary. Remember those mad minutes on LZ Ike? 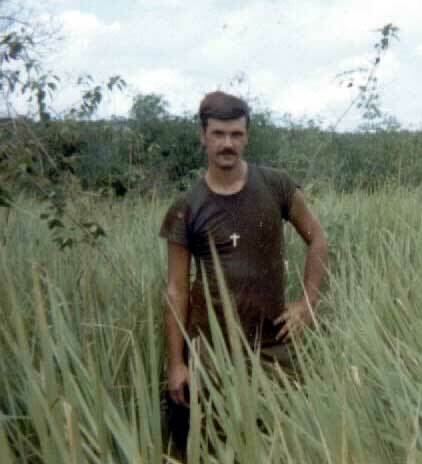 The trooper with the M-16 was Narcico Reyes, 2nd squad, 2nd platoon, from New York. Comedian George Gobel greeted 2/5 troopers at LZ Mary. Read Mike Hayes' story about the visit.